Blow-it-to-smithereens creature feature with superficial metaphors. War of the Worlds (2005) teamed director Steven Spielberg and Tom Cruise together in a surefire light up the skies blockbuster formula. In a mindless way, the movie is rollicking excitement even when it’s hugely banal. The aliens’ motives are never that complicated – they want to terminate earthlings and take over the planet as their new habitat. By the looks of things, though, it would have been a lot simpler for them to take over Venus or Uranus where there would be no life forms to worry about relocating. But they chose Earth, so be it. The freakish weather patterns forge an ominous sign. The skies are filled with looming gray matter, and in the center of its spherical apex an abnormal series of lightning bolts strike the streets of New York. We’ve seen this sort of weather phenomenon to hype things up in “Independence Day,” “Twister,” “Armageddon” and “The Core.” Cue in a bunch of typical shots of everyday people gawking at the skies above them. 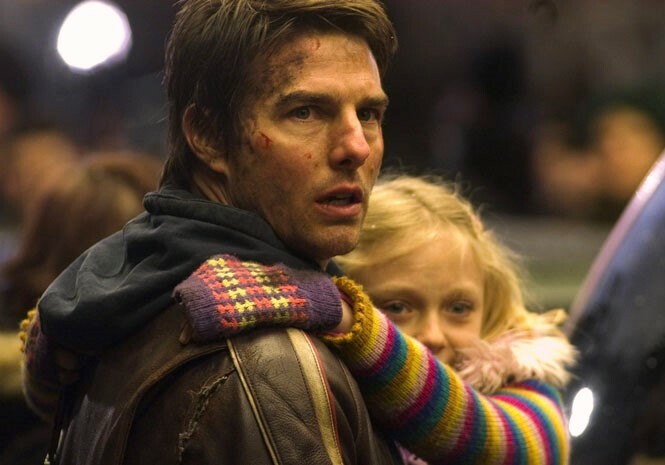 Tom Cruise, as crane operator and dad Ray Ferrier, remarks “how cool” to his two children (played by Justin Chatwin and Dakota Fanning). If Cruise is remarking to the special effects, then agreed, they are cool. The beings, which have been hibernating beneath the surface of the Earth, spring up from the ground and start zapping us. The aliens in attack mode, operating and attacking in three-legged machine tripods, force entire communities to run, run, run for their lives. There’s not enough science to explain why Ray is the only one to get an automobile to operate on a highway stunted with stalled cars – is there a theory about electromagnetic retrograde somebody can explain? Ray’s daughter shrieks and whines a lot in terror, his son scoffs in rebellion to the whole alien invasion. They go on the run some more. Hopefully so Ray can reconnect his kids with his ever-bitter ex-wife (Miranda Otto). We’re supposed to care as to why they split up. When a train on fire roars through a port city, there is collective community fear that there is no escape by transportation that’s going to work. People are going to have to trample on top of each other to get where they are going to go to next. Boarding a river ferry only seems like it will alleviate the problem, for survivors to get off their feet, away from bigger clusters of people. But then the aliens attack them while it is in the water, and the whole ship tipping over while bodies fall helplessly into the water is viscerally terrifying. Getting zapped is one thing, but there is peril in being crushed to death by wreckage or dragged under and drowned by various weights. Stunning action choreography, the lights, the sounds, the Spielbergian works. The battle of wills between Cruise and Tim Robbins (as a total nutcase, not subtle) in the basement is one section desperately stretched out a bit too long, almost as if there is the message that terror can be in had in too much hiding and avoidance. The events in Robbins’ basement allows the viewers to get closer to the naked alien as it infiltrates, and closer to its steel-saucer apparatus that it retreats to. If only Spielberg had allowed us to understand the enemy. They seem to zap half of us, and then capture and harvest the rest of us, even though there was no previous indication that the aliens needed our blood. 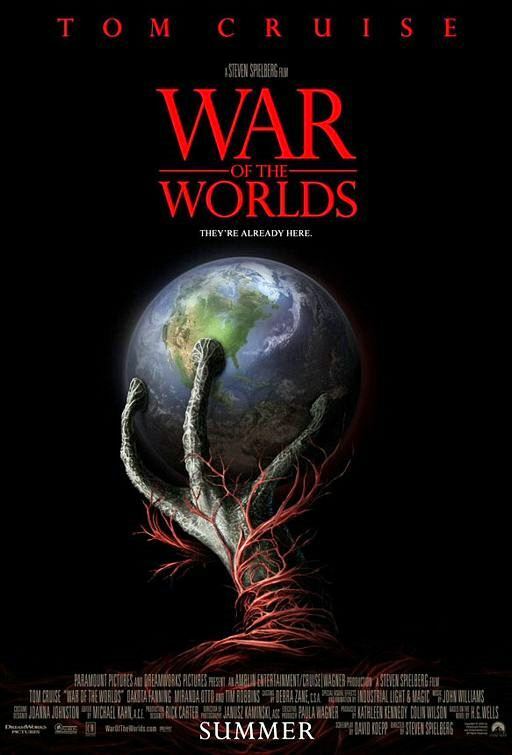 Without understanding and comprehension of certain details, it’s no surprise that “War of the Worlds” as a whole leads to a practically arbitrary conclusion as well. The story concluding on long-shot odds don’t seem remotely plausible (how did so many Boston brick-houses survive the mass alien zap devastation?). But the biggest gyp in storytelling sense in retrospect is to wonder why the filmmakers made Cruise’s one-dimensional flunky the front and center protagonist in the first place. Did he contribute anything special or become a miraculous man in statistics that merited him to be the film’s protagonist? Why not take the story point of view of a disgraced military man or general, or someone crucial to turning the tide of war against the aliens? I mean, a crane operator? Geez. Spielberg has enough of a camera eye to create some superficial allusions to 9/11 or panic in wartime, but it’s his basic ability at staging visceral thrills that gets us mindlessly involved in “War of the Worlds,” which otherwise is one of the dumber movies he’s made. Cruise’s better sci-fi action movies are “Minority Report” with Spielberg, and the current “Edge of Tomorrow.” Better because they are brainier. 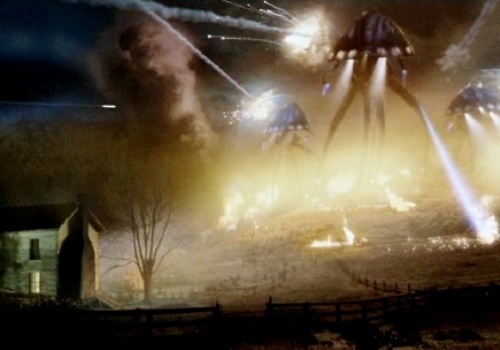 But I won’t deny that “War of the Worlds” is sorta fun as an exercise in narrow escape death scenarios. Film Cousins: “War of the Worlds” (1953); “The Thing” (1982); “Independence Day” (1996); “Transformers” (2007).